LOOK WHO’S COMING TO HEROES!! NEXT SATURDAY, December 1st from 11am-1pm come to HEROES with your Christmas List and a New, Unwrapped Toy for TOYS FOR TOTS! Bring your camera and take your picture with Santa and Mrs. Claus!! We welcome kids of ALL AGES, so bring the WHOLE FAMILY!! 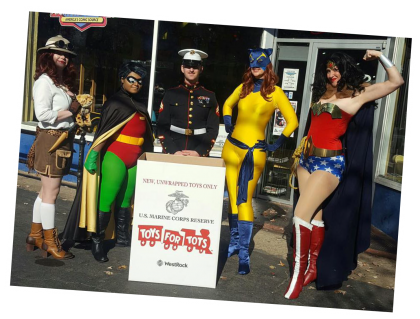 We will be collecting new, unwrapped, toys for Toys For Tots until Friday, December 14th with our second Toy Drive push the following Saturday, December 8th, featuring a SUPER SQUAD of Costumed Heroes! 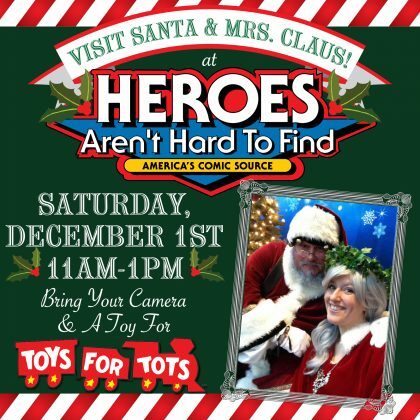 We hope that you will come out to meet Jolly Ole St. Nick and Mrs. Claus next Saturday, and will come out again the following weekend to meet some of your favorite HEROES! HEROESCON 2019 Tickets are ON SALE NOW!! From NOW until Midnight on CYBER MONDAY, November 26, you can get your 3-DAY ADVANCE PASS for just $37.00 in honor of the 37th Anniversary of HeroesCon!! This is a deal too good to pass up, and HeroesCon Tickets make an EXCELLENT Christmas Present for the comic-book lovers on your Christmas List!! ← HEROESCON 2019 :: ARTIST ALLEY TABLES ON SALE NOW! !